For those specifically interested in how to win at slots at Foxwoods, I’ve already taken the liberty of providing all the winning details in both the blog article Easily Win a Little at Slots at Foxwoods Casinos as well as a Professor Slots podcast episode #30: How to Win Small at Foxwoods-Montana Slots 2018. Providing useful information to my audience of slots enthusiasts comes first, right? 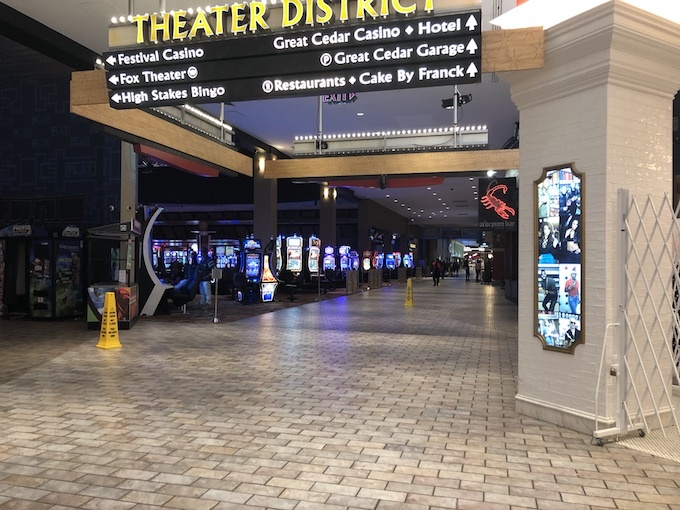 The intent of this article is to provide a perspective of what can be learned the first time visiting a casino, in this case Foxwoods Casino, as well as what was learned. I can split what I learned into two basic perspectives: What I observed as a slots player and what I learned from watching non-exclusive slots players, that is to say craps, blackjack, roulette, and poker players, when they play slot machines. 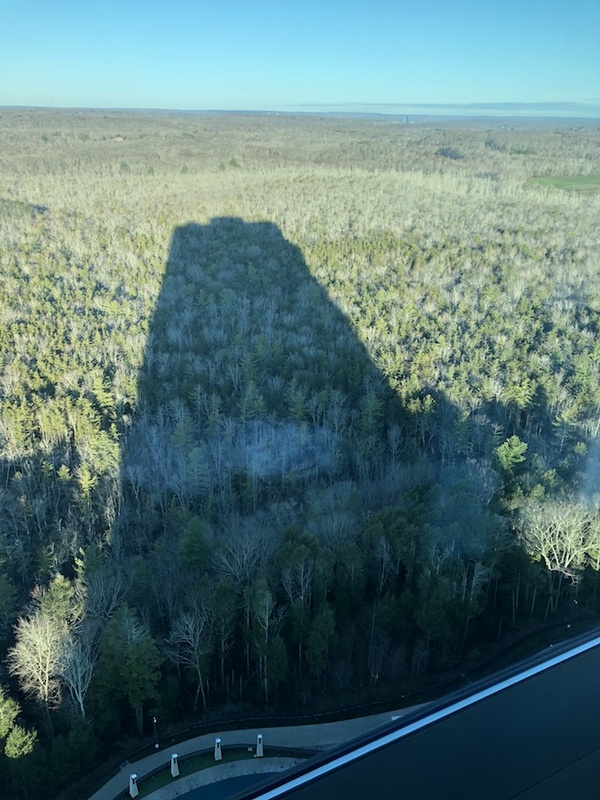 Foxwoods Casino Trip Report 2018 in Southern New England. As described in my last article, learning to win at slots at Foxwoods casino started off by simply walking around the casino grounds for hours and hours. I didn’t have a map, nor did I want one. I was simply observing, because that’s useful. I was trying to get a feel for the place. After a few hours of this, and making the observations detailed in the last article, I heard someone call out, “Professor Slots!’ It’s interesting meeting fellow podcasters for the first time. You generally have no idea who they are until they speak. Then, for me, I generally think they are taller than I expected them to be. It was Mark and Dr. Mike from the You Can Bet On That gambling podcast for the recreational gambler that called out to me when I was walking out. Specifically, Mark had spotted me. By the way, likely because of my Professor Slots shirt, that’s all I was ever called during this trip to Foxwoods Casino: Professor Slots! On their follow-up podcast, Mark and Dr. Mike were kind enough to mention I’d acted as a guide for them, to get them over to the other side of the casino where everyone was. I’d like to give a special thanks to Mark for adding my name after Professor Slots. That was unexpected and appreciated. Plus, he pronounced Friedl correctly, too! How to Easily Win a Little at Slots at Foxwoods Casino. 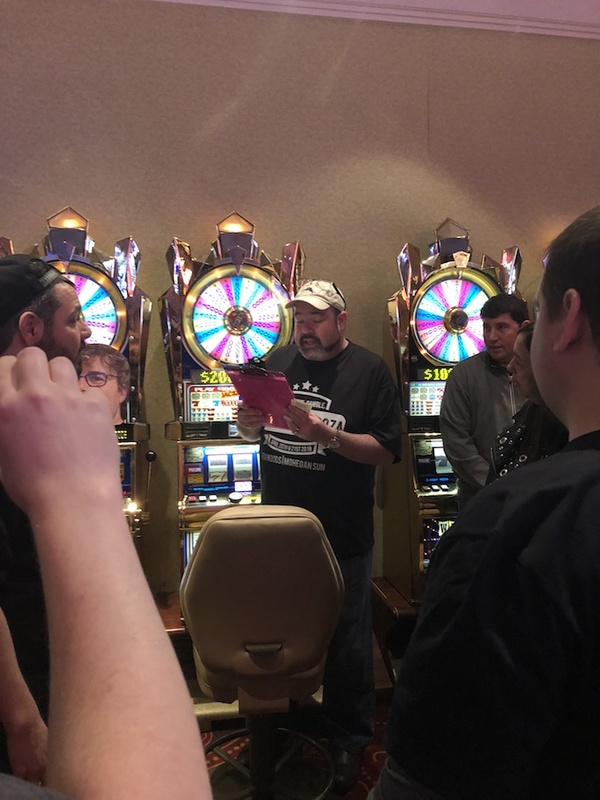 On Saturday, after a late morning group breakfast, Eric Rosenthal from the Vegas Confessions podcast had organized a high limit slot pull for this Gamblepalooza event. This had been planned by Cousin Vito for some time, with Eric using his vast experience from other meetup events to help run this slot pull. Not to boor you with the details of successfully organizing such an event, quite a few interesting tidbits stand out which I think you might find of interest. Prior to the event, I wondered if anyone would ask Professor Slots for his opinion. First off, my current understanding is that Eric had a bet with Vito about how many people would attend this breakfast. I did mention these were all gamblers, right? In the follow-up podcasts that have since come out, I learned that this bet existed. And, at the time, I didn’t know there was a group breakfast. I didn’t, that is, until Eric saw me in the hallway that morning saying that there was one. I attended when asked, of course. Again, I did mention these are gamblers, right? And, gamblers like to win! 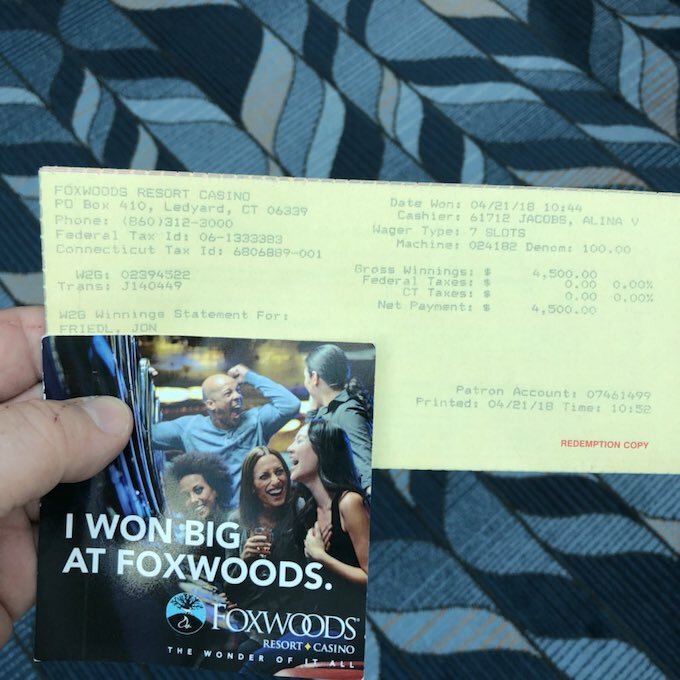 With that connection, I sat with Eric and his wife at breakfast, and I had a few moments to explain what I’d learned about winning at slots at Foxwoods Casino. When I suggested moving from slot machine to slot machine, to win a little at each, Eric kindly explained to me that doing so would be unpopular with the crowd. Lynching is such an ugly word, don’t you think? But, during the event itself, Eric was able to try a few of my suggestions. I don’t think they helped much, but the high limit slots pull didn’t occur in the casino I would have picked. It took place in one of the older casinos, as it happens. So, with everyone gathered around, Eric started off the event by carefully reading through the rules none of us had actually read. Basically, the plan was anyone who cared to could buy in with one or more shares of $100. Altogether, about 30 people had purchased 44 shares. Therefore, in this hand, Eric had $4,400. Another agreement amongst the group was to either double our money or spend it all. Unless we went over $8,800 at any point, we would spend it all. Cool, huh? Quickly, I should mention that they needed a volunteer to accept the tax burden for any taxable jackpot won. I have to say, I was a little shocked when nobody volunteered. When I saw this, I naturally stepped forward and volunteered. The applause was nice. The next step was Eric recommending that it be my players reward club card in the machine to get the associated rewards points for betting these thousands of dollars. I declined, pointing out I wasn’t a regular at Foxwoods. I counter suggested that it should be the rewards club card of our host, Vito. Again, the applause was nice. To help speed things along, Eric had inserted 20 of the $100 bills to create a $2,000 voucher. I don’t know if you know this, but some states have a limit on how much can be in a slot machine at any one time. In Ohio, and it seems Connecticut, the limit is $3,000. So, with $2,400 in the slot machine and $2,000 on a voucher held by Eric, the high limit slot pull began on a $100 denomination, 1-credit Wheel of Fortune slot machine. Again, quickly, several small 2 credit wins took place over time. With 17 credits left on the slot machine, and Eric’s $2,000 voucher yet unused, the slot machine landed on Spin. Up to this point, the crowd had started fairly excited, but that excitement had died down quite a bit over time. However, landing on a bonus spin, where a relatively large jackpot was assured, anywhere from $2,500 to $25,000. I was going to get a taxable jackpot! Once spun, we got a $4,500 hand pay jackpot. Filling out paperwork took a while, as it always does. And, handing over the stack of 45 $100 bills to Eric, from my open palm to his, was somewhat painful. But, those were the rules. So, we kept playing. Again, more 1- or 2-credit jackpots were won. However, no more taxable jackpots were run. We even switched to another slot machine or two. We even sped it up by just letting one person press the button on the slot machine. We did this until all the money was gone. Eric had been right. It could devolve into a lynching real fast. Eric helped move it along a bit, and everyone settled down, but I was struck with this observations: Craps people really don’t know how to play slots. Honestly, it’s not entirely about pushing a button or pulling a lever. What I saw was completely different than boredom. I saw many small wins, meaning we’d picked a fairly good winning slot machine. I saw a hand pay after having made about 20 bets. Things were going great! Where we went wrong, if I might be so bold, was not having a large enough bankroll to make 100-120 bets on a 1-credit, $100 denomination slot machine. Yes, we brought the original $4,400 bankroll, added a $4,500 hand pay, and won 1- and 2-credit jackpots perhaps 10 times. So, we’d made nearly 120 bets overall. But, that’s not good. As I’ve discussed in the past, we need to be able to make 100 to 12o bets with our original bankroll in order to play the machine for long enough to have a fair chance of winning. And, we didn’t. Instead, we started with enough to make 44 bets, then did well enough to eventually get nearly 120 bets by using our winnings. Imagine what could have happened if our originally bankroll was enough for 120 bets! Yes, with all other considerations being equal, it would have taken 3 times as long to play nearly three times the bankroll. But, it would not be unreasonable to think we would have gotten 3 hand pays instead of just 1 taxable jackpot. If so, I would not have been surprised if we would have been able to bet 3 times 120 or 360 bets on that high limit slot machine. This is all just reasonable guesswork, of course. But, it’s still reasonable. It follows the patterns for slots play I know and recognize. But, it wouldn’t have been worth getting lynched over. And, people wanted to move along. It was too much work to win a profit, I guess? In all seriousness, as far as I could tell, these were all entertainment gamblers out for a good time. Their gambling goal wasn’t about making money. So, we didn’t. But, it was entertaining … for a little while. One evening, standing next to an active craps table for the first time, I mentioned to Mark Devol just that fact. I am delighted to say, he then showed me how to play craps. I’d been listening to his and Dr. Mike’s podcast, You Can Bet On That, so I had heard the terminology. But, it really was helpful for someone to point at a spot on the craps table during these explanations. Besides learning how to play craps, I just had to ask Mark what a well drink was. This is something that is often mentioned on their podcast, that so-and-so owes them a well drink. Mark explained what it was, which certainly matched the tone he and Dr. Mike use when talking about well drinks on their show. Speaking of their podcast for the recreational gambler, it is mentioned often enough that Dr. Mike likes to parley when playing craps. I was again delighted when he parleyed while I was standing between him and Mark being taught craps. In a loud whisper, I said to Mark, “I just heard Dr. Mike say parley!” in an awed voice. Dr. Mike heard, and gave me a grin. For me, now and forever more, that’s craps. One question I didn’t get answered, because I only thought of it afterwards, is what the heck is going on with taxable jackpots during craps games. Do they get hundreds of them per year like high limit slots players do? Do they ever happen at all? What about during blackjack and poker? I’m planning to shortly call in to Mark and Dr. Mike’s show to ask that question. Maybe all us slots enthusiasts will then find out! If so, I’ll let you know. Gamblepalooza was my first meetup event where I met fans of the show. John was there, whom I’d talked with before as part of a consultation. I spent a significant amount of time with him talking about slots, because it was one of my goals for the trip. He was one of my first fans, which I appreciated. With him, I shared everything. Everything from my last article, and more. I also shared it with his friend Michelle as well as his girlfriend whom, since I don’t know if she wants her name shared, I’ll just call Professor Amy. John and “Amy” will know who I mean. In any case, it was great meeting all three of them. Thanks, John, for introducing me to them as well as your rather lively and detailed questions. If you have any follow-up questions, do let me know. I also met Ernie, who very earnestly stated that he’s listened to every one of my podcast episodes. Wow. That was a big moment for me. I mean, I talk and talk into this empty room. But, to hear back from someone? Just … wow. I also met others, all very nice people. With a couple of people, included a pleasant couple from Canada, we talked about quantum physics, just a little small talk, during that first night. That was wonderful, and very relaxing. And, then there were some more random people at the event that were also interested in slots. They seemed to appreciate being able to talk to someone who focused entirely on slots. I’d heard that from others, but it was really evident at this event. The surprise on their faces of finding someone, and their breathless questions once they started asking them, gave me a strong feeling that I’m starting to make a difference. Which is the point, right? Unfortunately, I don’t have everyone’s names to share. I’ll have to do better at that at future events, maybe take more notes as the day progresses, but it was truly wonderful to meet all of you. It keeps me going! In summary, during late April 2018 I attended a gambling podcaster and fan meetup called Gamblepalooza at Foxwoods Casino in southern New England hosted by the Cousin Vito Casino Podcast. I participated in high limit group slot pull, was taught to play craps by Mark DeVol, and met fans for the first time. For details on how to win at slots at Foxwoods, be sure to visit either my blog article Easily Win a Little at Slots at Foxwoods Casinos Connecticut or the Professor Slots podcast episode #30: How to Win Small at Foxwoods-Montana Slots 2018. 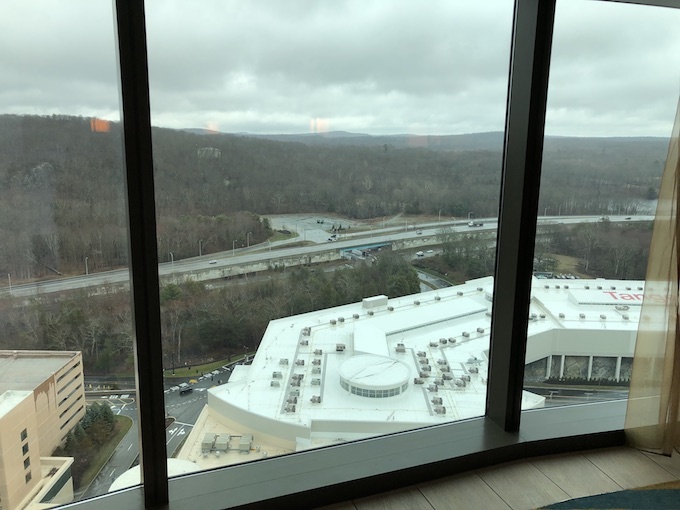 At this event, fans have requested more trip reports, so I have prepared this Foxwoods Casino Trip Report 2018. More such trip reports will be coming, as well as more articles on the history of slots and winning strategies. If you have any suggestions for topics you’d like me to cover, just drop my an email or leave a voicemail message on my hotline at 937-696-0086. 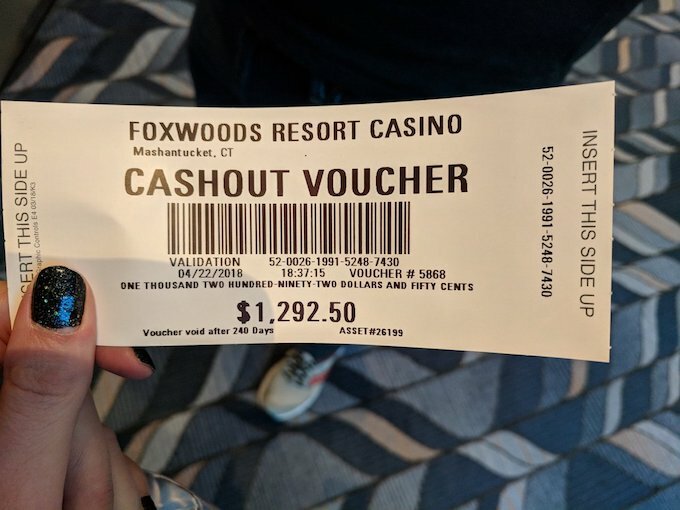 Previous: Easily Win a Little at Slots at Foxwoods Casino Connecticut – Over 3 days I explored Foxwoods Casino Connecticut in southern New England, the largest tribal casino in the world. I met fans, fellow gambling podcasters, figured out how to win small jackpots on slot machines, and then showed fans how to do so as well as proceeded to do so myself. Here, I explain exactly how I did it. Next: Five Ways Nevada Leads World Gaming Industry – Much has changed in the gaming industry over the last 10 years, with so many more casinos available closer to home for most people. One important aspect that has not changed is the Five Ways Nevada Leads World Gaming Industry. Nevada’s leadership role is important as your state’s gaming regulations should matter to you.